The 2012 Ghastly Award Nominees are in! 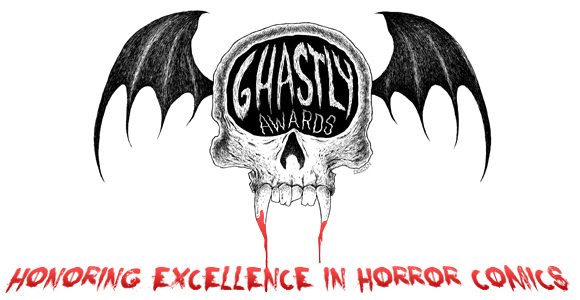 The Ghastly Award Judges are proud to announce the 2012 Ghastly Award Nominees. The nominees, which were chosen by the entire comic creating community, reflect the wide range of horror material being published in print and web comic form today. Named after acclaimed comics creator “Ghastly” Graham Ingels, the awards are now in their 2nd year. Created to honor excellence in Horror Comics, every comic creator had a say in who the nominees were by nominating their favorites throughout the year. Fan and Creator Voting will be open from January 1, 2013 until January 31, 2013. Click HERE to find out who has been nominated, and prepare to cast your vote on Tuesday, January 1st!